Three-dimensional display of magnetic field surrounding a cylindrical permanent magnet. Zoom-in to study the field in the vicinity around the object, or zoom-out to investigate the field at great distances. The cursor can be positioned at any x,y,z location to obtain the precise magnitude of the magnetic field. Current-carrying wire loops arranged in a circle with the resulting magnetic field lines shown in three-dimensions. Any number of magnetic field lines can be generated. All 3D graphics can be rotated about multiple axes to generate a real-world perspective. 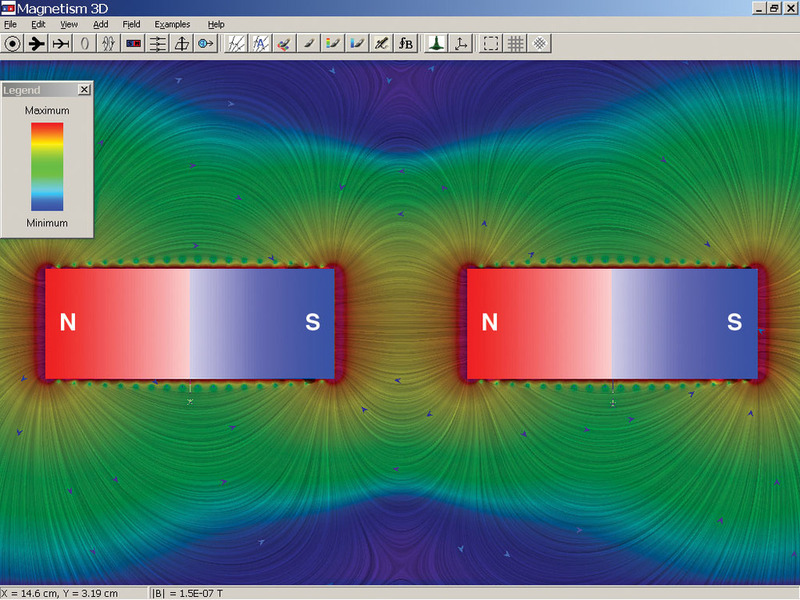 Magnetic field shown for two straight wires with oppositely directed and unequal currents. Two-dimensional display of magnetic field produced by two permanent magnets. Continuous magnetic field lines (linear integral convolution) are shown with color coding indicating field strength. The cursor can be positioned at any location to obtain the precise magnitude of the magnetic field. Two-dimensional display of magnetic field produced by a solenoid. Continuous magnetic field lines (linear integral convolution) are shown with color coding indicating field strength. 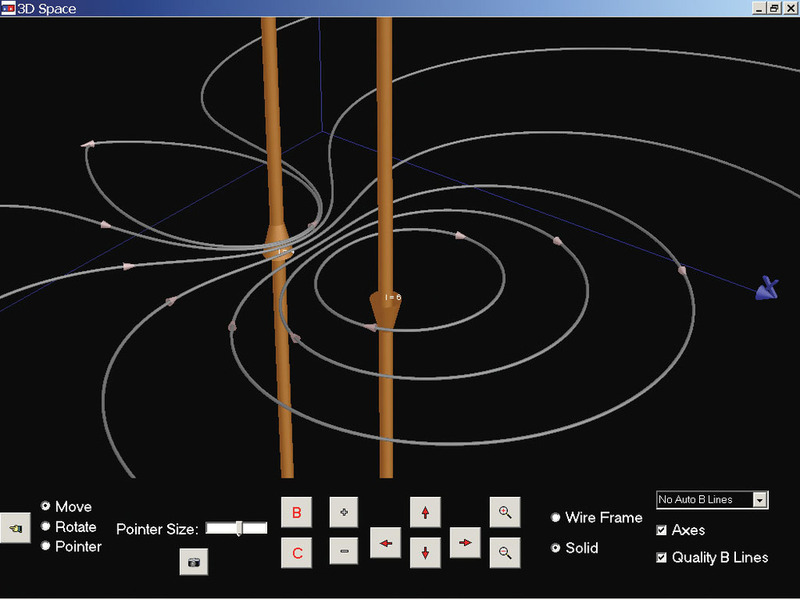 Similar to Electrostatics 3D, Magnetism 3D is an interactive software program that allows students to study magnetic fields using a variety of stunning visualization methods. Magnetism 3D utilizes colorful two-dimensional and three-dimensional graphics to display magnetic field lines for current-carrying straight wires, current-carrying wire loops, solenoids, and permanent magnets. The three-dimensional graphics can be rotated in space about multiple axes for a true 3D perspective. The user is provided with a wide variety of simple to use tools that permit any desired configuration comprised of any number of objects to be created on-screen. Simply click the desired object from the toolbar, input the chosen parameters, and position the object on-screen. 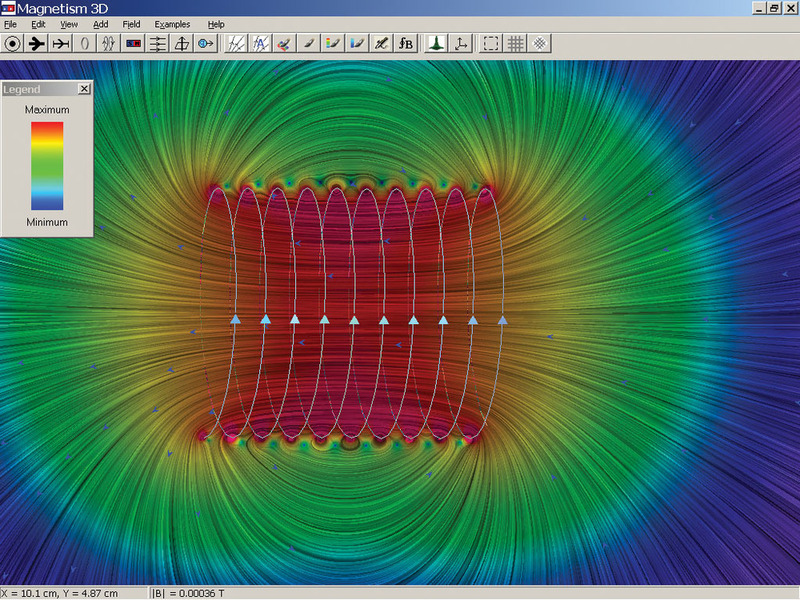 View magnetic field lines in a 2D and 3D environment. Choose from a variety of magnetic field generating objects that may be used in any combination including: current-carrying straight wires, current-carrying wire loops, solenoids (with or without an iron core), and permanent magnets. All objects can be customized by inputting values such as current, length, radius, loops per centimeter . . .
View options include: 3D space, 3D topographic mapping, 2D surface, 2D color-coded mapping & linear integral convolution, and 2D iron filings. Option to display on-screen magnetic field vectors indicating individual contributions from various objects and net magnetic field for any location. Numeric display indicates strength of magnetic field at any location (both 2D and 3D environment). Option to display the path of a charged particle as it moves under the influence of the magnetic field. Capability to explore Ampere’s law. 10% discount applied to combined price when purchased with Electrostatics 3D.